Queenstown offers the perfect setting for adventure, relaxation and fun all year round. With a buzzing atmosphere and stunning scenery, you will find there is no other place in the world quite like Queenstown. For iconic views of the city and Lake Wakatipu take a ride on the Skyline Gondola which climbs its way to Bob's Peak, where visitors can enjoy a peaceful walk or visit the Kiwi and Birdlife Park when reaching the bottom terminal. 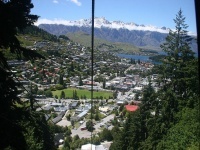 Around town, one can take a leisurely stroll through Queenstown Gardens or take in the view from the Ben Lomond walkway. For the golfer, there are plenty of world renowned courses to choose from around Queenstown and for the wine fanatic, there are some of New Zealand's finest vineyards around which one can plan a day of excellent wine tasting. For something truly special, visitors to Queenstown should not miss out on a visit to Lake Wanaka, which was voted as one of the world's top 10 most romantic destinations in the world and sports the most photographed tree in New Zealand. As part of the Southern Scenic Route, Queenstown is ideally located on a tourist highway in New Zealand linking Queenstown, Fjordland, Te Anau and the iconic Milford Road to Dunedin via, Riverton, Invercargill, and The Catlins. If one has the time and an adventurous spirit, an Australian travel magazine labelled the Southern Scenic Route as "one of the world's great undiscovered drives" in 2008, so rent a car and start exploring the most beautiful scenery which can be found in New Zealand.